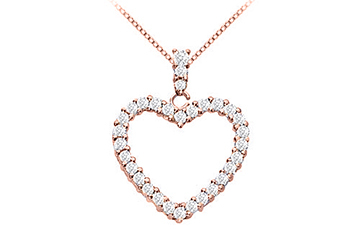 Simple and sleek heart shaped pendant is gracefully studded with floating round cubic zirconia prong set in a subtly open heart necklace in sterling silver polished with 14k rose gold vermeil with total weight of 1.25 carat. Accented on top with three brilliant cut round CZs and it dangles from 16 inch rose gold vermeil box chain. This beautiful heart pendant is the best jewelry for all occasions and outfits.